Chicks: What roles do the parents play in raising the young? Question: What roles do each of the parents play in feeding and raising the chicks? Answer: The roles vary as time passes due to the changing needs of the nestlings. The chicks must be brooded in their first week (about eight days) because they can’t regulate their own body temperature. The mother peregrine does most of the brooding, especially the night shift, while the father does most of the hunting. During the brooding phase the father typically calls to his mate as he brings in food. 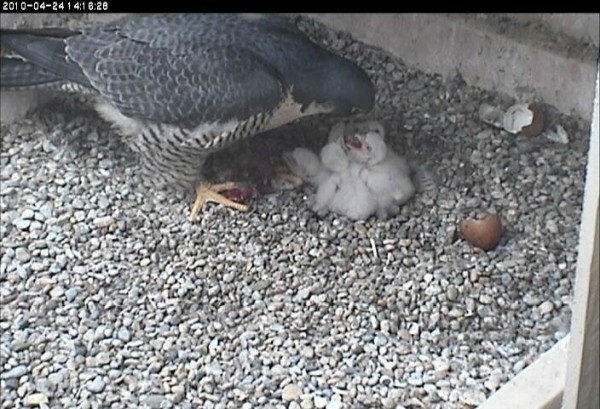 She leaves the nest to accept the food delivery and eats a little off camera while he broods the chicks. She then returns to the nest and feeds the chicks. By their second week the chicks don’t need an adult to keep them warm but they do need a lot of food. At this point both parents hunt, feed the young, “take out the garbage,” and guard against predators. The parents capture more food than they need and cache the extras on the cliff for a rainy day. Note that in all of these descriptions the division of labor varies among mated pairs and from year to year. Some males rarely brood and feed the chicks. Others take a more active part. When one of the pair is not well, the other fills in the gaps. Peregrine couples work as a team.